At the March meeting of the California Water Commission, Amanda Montgomery, Chief of the Permitting Section for the Division of Water Rights at the State Water Resources Control Board was on hand to discuss the complex issue of water rights permitting and change petitions. Ms. Montgomery’s presentation focused on post-1914 appropriative water rights which the Board oversees, covered the processing steps and timelines for processing applications, highlighted fully appropriated streams and state-filed applications, and discussed change petitions, processing, and timelines. A water right is “usufruct”, which Ms. Montgomery explained meant that the state holds the ownership of the water, but others are allowed to use it as long as that use does not waste or destroy the water. Beneficial use of water shall be maximized: Ms. Montgomery noted that when the water board staff looks at applications, they are looking to make sure that the beneficial use is maximized. There are several types of water rights in California, such as appropriative rights issued before 1914, pueblo rights, prescriptive rights, riparian rights, and adjudicated rights, but Ms. Montgomery’s presentation focused on post-1914 appropriative rights. Post-1914 appropriative rights are administered by the Division of Water Rights at the State Water Resources Control Board. 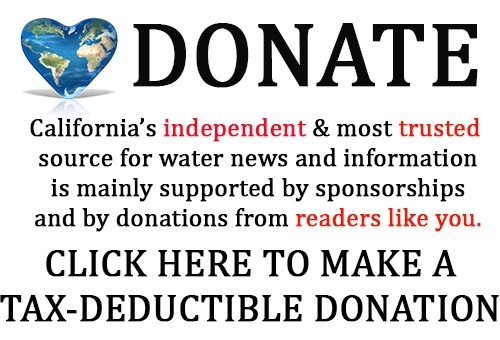 The general principle is ‘first in time, first in right’, which comes from the state’s Western heritage and the idea that whoever files or gets their water rights first, those parties are first to get water in a period of shortfall, and if there’s anything left, it goes to next junior water right. Post-1914 appropriative water rights can be sold. However, the amount of the water right cannot be increased once the application is submitted. 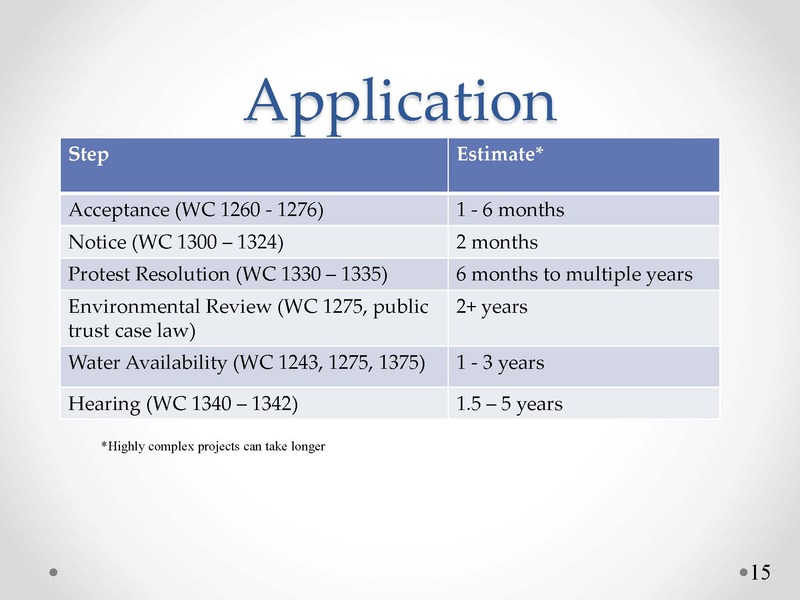 The application sets the amount they are requesting, the rate, and the time of year they are going to take the water out of the stream, and those amounts cannot be increased later. If the party wants to increase their water, they must submit another application to get another water right. 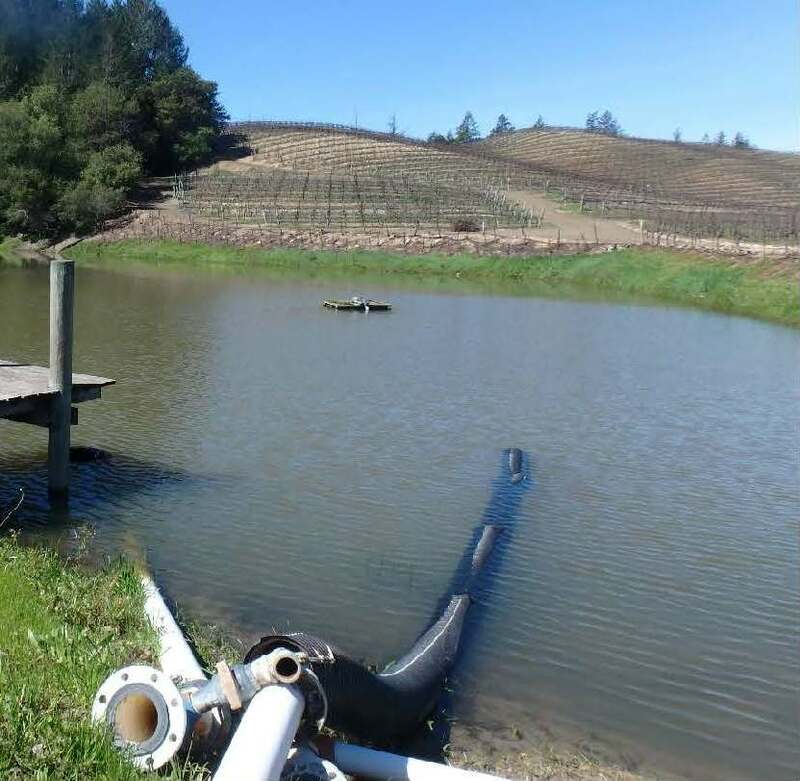 Ms. Montgomery said that there are 385 water right applications pending and the vast majority of them are small vineyards on the North Coast with small ponds. The other types of projects include municipal, industrial, and all kinds of other projects, but rarely are there applications for big dam projects. 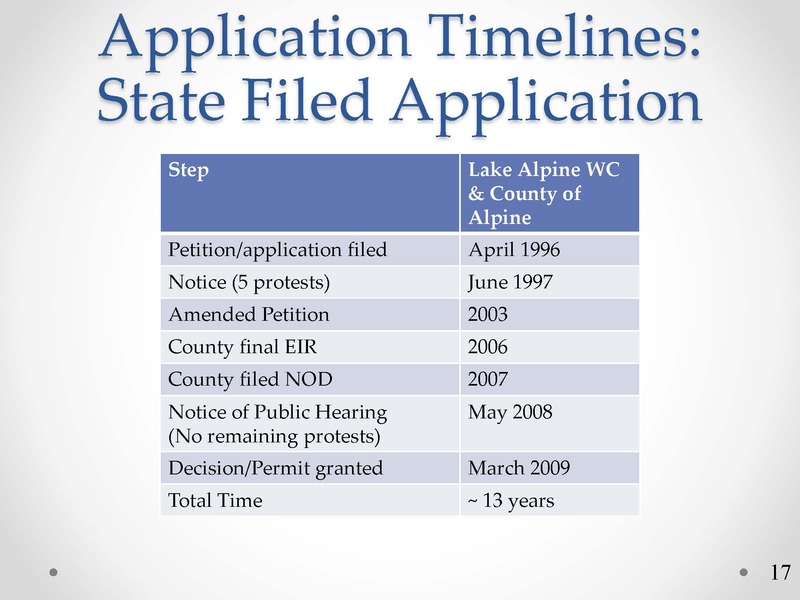 An application is the process to obtain the permit, but the application itself is not a water right. Once a person has a permit, there is a development period which is the time to build the project, start diverting water, and then put it to beneficial use. The development period could be as long as 15 to 20 years. Once the development period is complete, whatever amount they have been able to use is what they are licensed for and that locks in their water right. Priority: The rule is first in time, first in right, so the priority date is the date the party files their application. Quantity (amount and rate): The amount of the water right in acre-feet per year and the rate or how fast they will be taking water out of the river; the amount and rate set the quantity. Season of diversion or when the party is diverting from the stream: These days, the new applications for water rights tend to be in the winter, Ms. Montogomery said, noting that older water rights tend to be more reliant on snowmelt, so they are more likely to be in April through the middle of summer. Purpose of use: How the water is planned to be used, commonly irrigation, municipal, industrial, or fish and wildlife enhancement. Place of use: Where the water is to be used. Place of use for municipal projects is usually city limits; it could also be an irrigation district boundary. Ms. Montgomery noted that the SWP and CVP have very large places of use encompassing large portions of our state. Other conditions such as to protect prior water right holders and the environment: There can be numerous conditions placed on the permit; some are statements of law, and some are conditions that are put in place to protect prior right holders, and/or the environment. 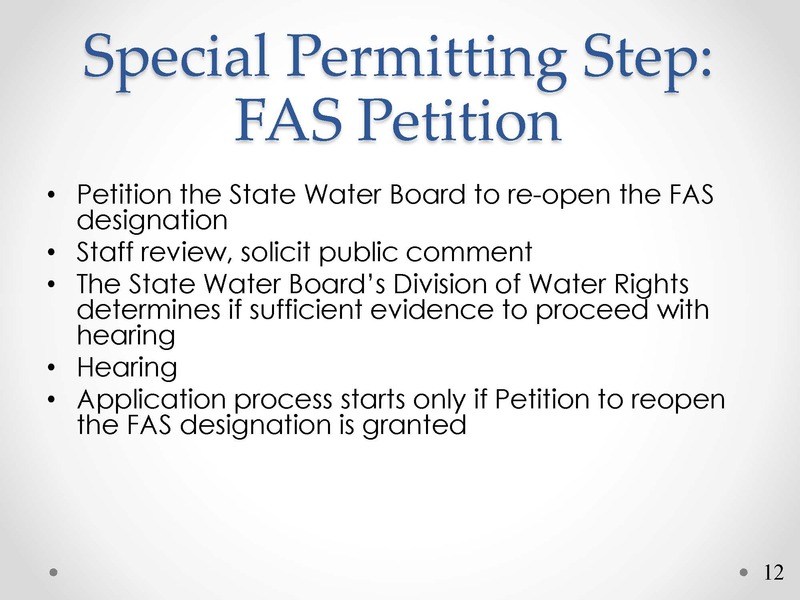 The first step is for the applicant to submit the application to the State Water Board where staff check to make sure that it’s complete. Once the application is deemed to be complete, it is publicly noticed, which provides the public an opportunity to object to the project if they have concerns. 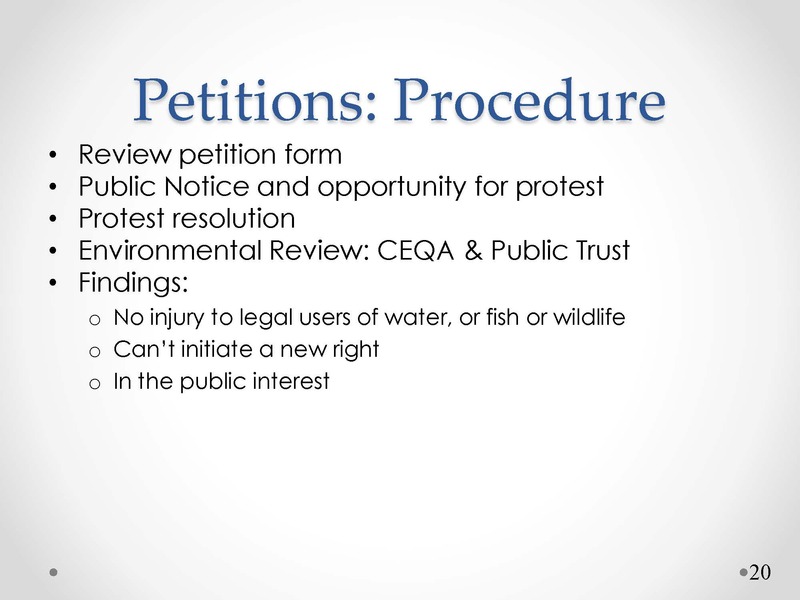 Grounds for protests include injury to senior water rights, environmental injury, public trust related to fish or wildlife, recreational interests, or if a party thinks that the project is not in the public’s interest overall. The public notice period lasts for about 60 days. If any protests are received, the applicant is directed to respond to the protests. The applicants write up their response to the specific points that are brought to their attention, and then the applicant and the protestants are directed into a period of negotiation for a minimum of 180 days, although it frequently can last years. Ms. Montgomery explained that the delays are usually because there are data that needs to be produced, studies that need to be performed, or modeling that needs to be done, and these things take time. Protests can sometime be settled by the inclusion of permit terms and any permit term can be included as long as it’s under the State Board’s jurisdiction. However, if protests remain unresolved, they must go before a hearing at the State Water Board, where the parties present their points of view, and eventually the Board decides how to proceed. Another step in the permitting process is the environmental review. The CEQA analysis is the responsibility of the applicant. 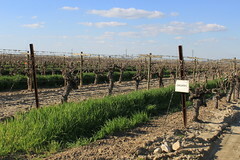 Major projects usually have applicants who act as their own lead agency, although the State Water Board does act as the lead on the small vineyard projects with private landowners. 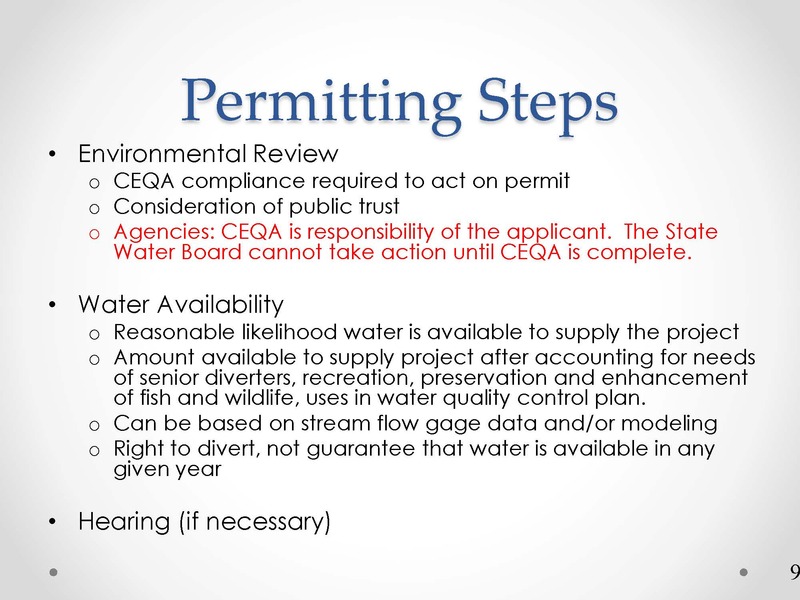 The State Water Board cannot take action on the permit until the CEQA is completed and filed with the clearinghouse. Consideration of the public trust is also part of the environmental review. Ms. Montgomery noted that as a result of the Mono Lake Audubon decision decades ago, when the State Water Board is considering permitting or petition actions, the Board needs to consider the public trust on the behalf of the State of California and to add conditions to permitting that are reasonably achievable to protect those public trust resources. “The first and foremost that comes to mind is fisheries and other wildlife; it’s also things like recreation, aesthetics, so that’s a separate authority aside from CEQA,” she said. A water availability analysis must be performed, as the water code requires that the State Water Board can only issue a permit if there’s a reasonable likelihood that water will be available to supply the project. The analysis involves figuring out how much water is in the stream, then subtracting the senior water rights and how much must be left in the stream for public trust or environmental needs; whatever is left over is what is available for new diversions, she said. She noted that the Board also considers water quality control plans and the water that is required there. The water availability analysis is based on streamflow and gauge data as well as modeling in complex ecosystems like the Delta. Ms. Montgomery noted that one difficult thing about water availability analysis is figuring out how much is needed for the fisheries resources. “Very few of our streams in California have objectives set for flow, for protection of fisheries, so many times the parties are consulting with CA DFW, with federal fisheries agencies, and conducting special studies to try and figure out how much is needed for fisheries, unless that information is available in that particular watershed,” she said. A hearing (if necessary) is also part of the permitting process, she noted. Fully appropriated streams are those where there is insufficient supply for new applications or allocations; the regulations are spelled out in Water Code Section 1205 through 1207. The State Water Board maintains a list of fully appropriated streams that has been updated over time, most recently updated in 1998; it is Order 98-08. Parties can file a petition to challenge a Fully Appropriated Stream which would happen prior to the application process. Ms. Montgomery presented a slide from Order 98-08 which is just one page of the 75 page document. The document contains a long table which is listed by county. She picked one of the entries, which was the San Joaquin River in Madera County, noting that the San Joaquin is listed for other counties as well. It is a tributary to the Delta and it’s fully appropriated year-round, January to December. She noted that some rivers are only fully appropriated during the summer, but the San Joaquin River is year-round, it is from the confluence of the Mendota Pool upstream, so the whole Friant-Millerton area is fully appropriated. The listing also has a footnote (1), which means that all the small tributaries that come into the San Joaquin are also fully appropriated; not every single stream in the state is fully appropriated in that way where the entire watershed is fully appropriated, but the San Joaquin is and many of them are that way, she said. When a person turns in a petition to challenge a Fully Appropriated Stream, staff reviews the petition, asks for more information if necessary, and then solicits public comment to see if the public has any input. After that, the staff reviews the information and takes it to the Deputy Director to make the decision if there is sufficient evidence to proceed with a hearing. If there is not sufficient evidence, that’s the end of that petition; the person can always reapply, but the petition is done. If there is sufficient evidence, then there is notice of public hearing, the hearing is held, and then a decision is made. The application process only starts if the petition to reopen the Fully Appropriated Stream is granted. A state-filed application is unique, Ms. Montgomery said. In the past, the State of California filed water right applications as future projects, sometimes with a specific project in mind, as maybe a district was thinking about a project in the future. Ms. Montgomery presented a graph depicting the years to process applications from 2000 to 2017. She pointed out that the highest bar is one to three years, which is a good thing; a significant amount of applications are also processed within four to six years. However, it can range to more than 15 years, so there is a wide range of how many years it takes to process. 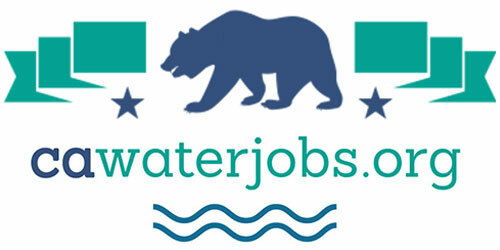 For a typical complex project with a motivated applicant, she presented a slide with timelines for the process, noting that ‘WC’ indicates the water code section as everything the State Water Board staff does is required in the water code or the water code plus the California Code of Regulations. The process of getting the application in and getting ready to notice could take anywhere from one month at a minimum to up to six months. For a major project, the code requires 60 days for the process of being noticed to the public. Protest resolution can take anywhere from six months at a minimum to multiple years; Ms. Montgomery pointed out that this is not under the State Water Board’s control as it’s really up to the applicant and the protestants; if they can resolve the protests, they come to the State Board with the resolution, but if they end up at an impasse, then it goes to a hearing. The environmental review which includes CEQA and the public trust is a minimum of two years. How many years it takes really depends on the lead agency and how fast and complicated their process is, she said. A water availability analysis can take one to three years, assuming modeling and working out issues with what is needed with fisheries, she said, noting that protest resolution, environmental review, and water availability are things that can be happening concurrently, and not necessarily sequentially. Often, once water availability and CEQA are done, then the protests can be resolved, because the data is there, she noted. At the end, there is a hearing. This can take anywhere from 1.5 to 5 years, depending on the complexity of the project and the number of protestants. 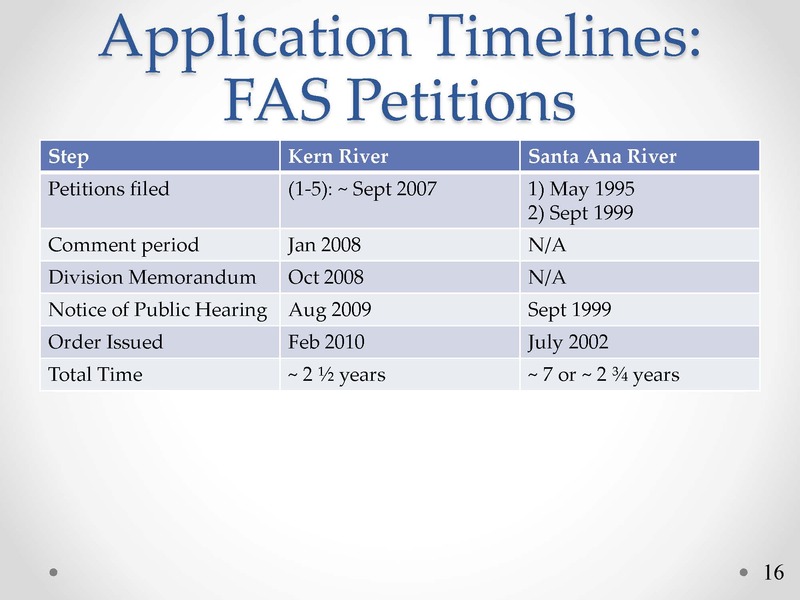 Application timeline for Fully Appropriated Streams: The two most recent examples of fully appropriated stream petitions are the Kern River and the Santa Ana River. The process includes the public comment period, the decision process of deciding to have a hearing of not, the notice of public hearing, and finally the order being issued. For the Kern River, this took 2 ½ years. The Santa Ana was a bit unique in that it had two different parties that petitioned; from the first parties petition, it was seven years, but once the second party got involved, it was only 2 ¾ years. Ms. Montgomery then turned to water right change petitions, noting that they see a wide range of change petitions from a petitioner who just wants to move their pump slightly upstream or downstream to much more complex change petitions. 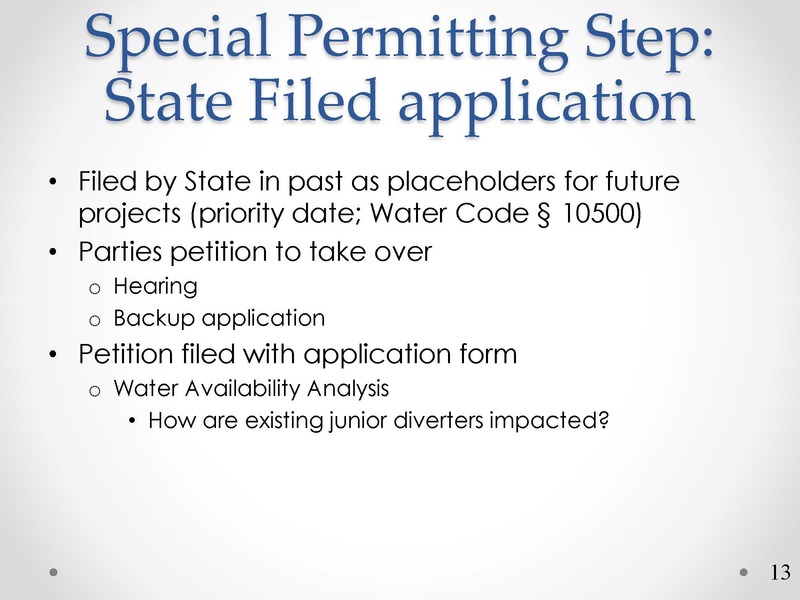 Common types of permit and license change petitions include change in the point of diversion, change in where or how water is used, change in how storage is distributed, and more time to develop the project or a time extension. Change petitions cannot be used to initiate a new water right, she said. The procedure for processing the change petition is similar to the process for applications. State Board staff review the petition and there is public notice and the opportunity for protests. Protest resolution lasts 180 days and longer if needed. CEQA is needed and the public trust must be considered. Just like applications, protests resolution, same thing, same 180 days and longer if needed. The findings for change petitions are that there can be no injury to legal users of water or fish and wildlife. The change cannot injure other water users, and in the case of a change petition, this involves junior water right holders. The change petition cannot initiate a new right, and it has to be in the public interest. 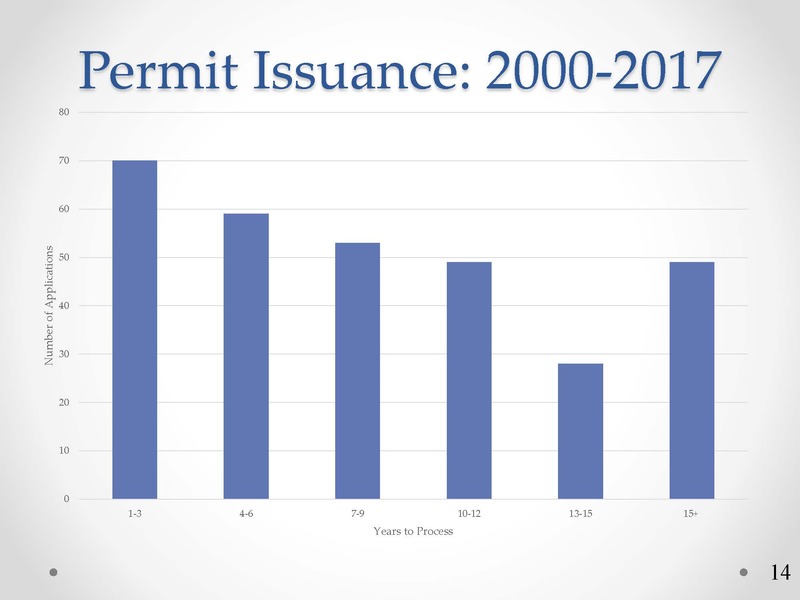 Once a permit or license is issued, the permittee or license holder can choose to forego diversion of their water for consumptive uses, and instead leave the water in the stream or the river. Ms. Montgomery explained that you can leave that in the stream for a set distance and that distance becomes place of use under the water right. Instream flow dedications happen primarily in two ways. Sometimes a nonprofit buys the land and dedicates the entire right to fish and wildlife enhancement, and in other situations, they are only dedicating a portion of the right. She noted that dedicating a portion can be more complex, because when they are only dedicating a portion of the right, they are still maintaining their consumptive uses, so usually the way that the Board writes it is giving them the ability to elect to dedicate or not dedicate; oftentimes, the parties will decide to have another agreement behind it that sets the requirements that they actually do the dedication such as a forbearance agreement, but that agreement is between the parties themselves and not with the State Water Board. 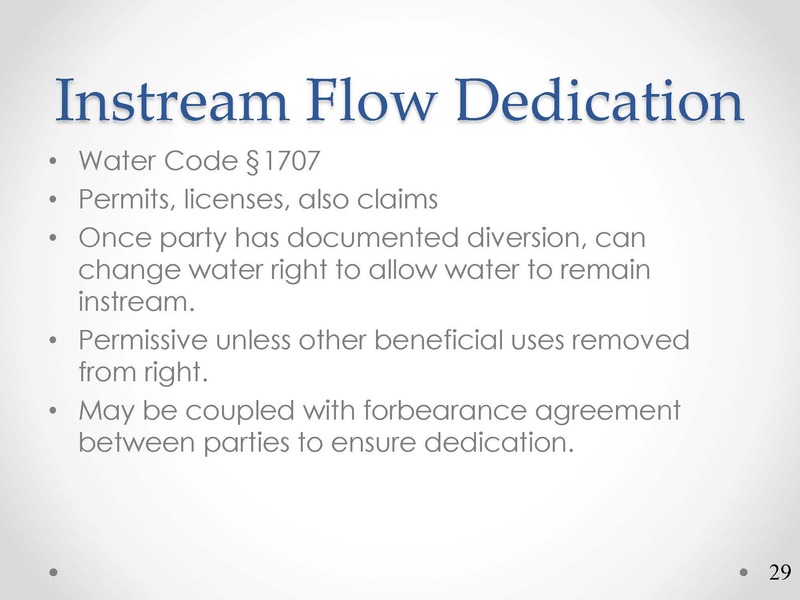 Instream flow dedications are described in water code section 1707, and it applies to permits and licenses. Pre-1914 or riparian right holders can also dedicate their water, so once the party has documented a diversion under a permit, then they can change the water right to allow beneficial use to be in the stream; it’s permissive unless other beneficial uses are removed from the water right, she said. 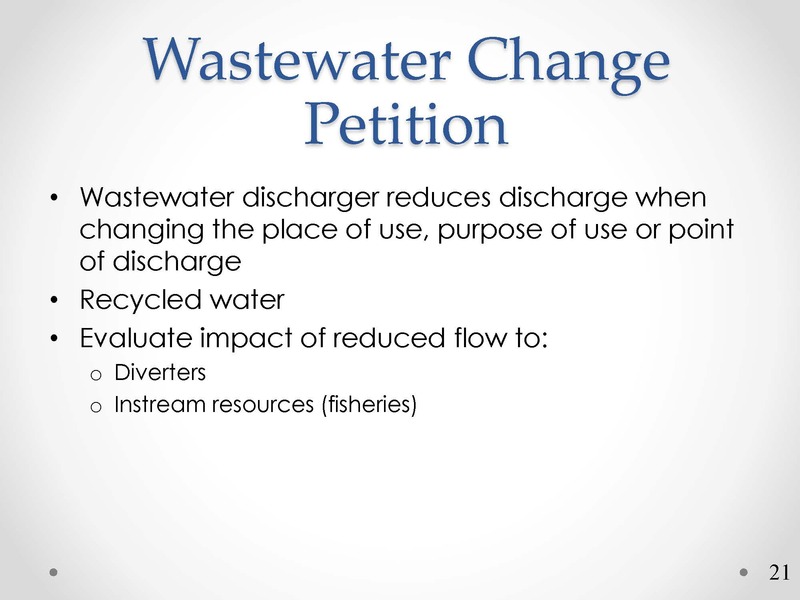 A wastewater change petition is similar to other types of petitions. It needs to evaluate the impact on other diverters because they are going to be putting less water into the stream, so there’s less water in the stream for others to divert; it must also consider instream resources, such fish and wildlife, she said. She presented the timeline for a typical complex petition. Similar to applications, it takes one to six months for completeness review. Public notice is only one month; protest resolution can last 6 months to multiple years. Environmental review, assuming EIR is two years, which can occur concurrently with the processing. 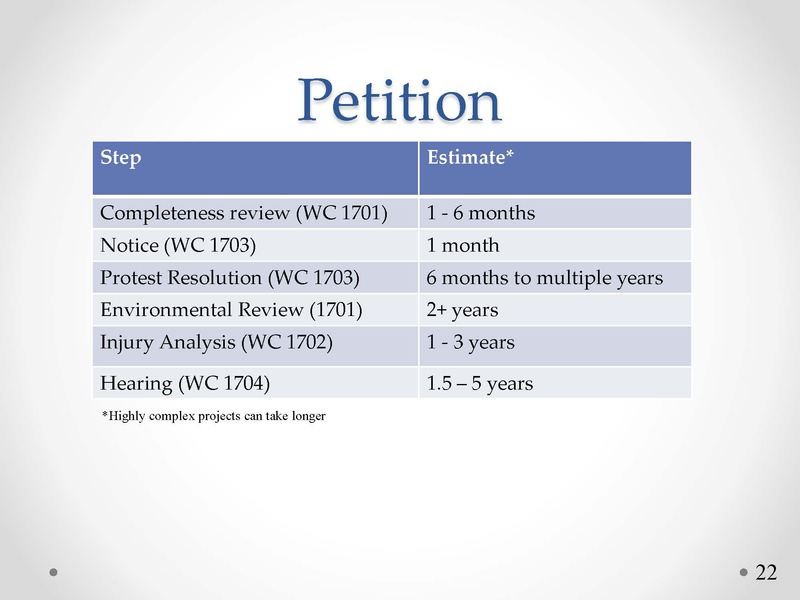 Petitioners need to do an injury analysis to make sure other water users and the environment are not injured; this can take one to three years. If the protests cannot be resolved, there is a hearing. Wastewater change petitions are processed faster; Ms. Montgomery attributed this to highly motivated petitioners who are simultaneously seeking funding through the State Water Board’s funding mechanisms for recycled water. She noted there are some wastewater change petitions that can take years, such as in the Santa Ana River with the Santa Ana sucker and their needs for habitat conservation and things can’t move until issues can be satisfactorily resolved. Ms. Montgomery concluded by giving her thoughts on how to speed up processing. She noted that on the big controversial projects, if the applicant can develop additional information to evaluate the protest concerns, thoroughly and completely and in a quick manner, that will help get it to resolution. 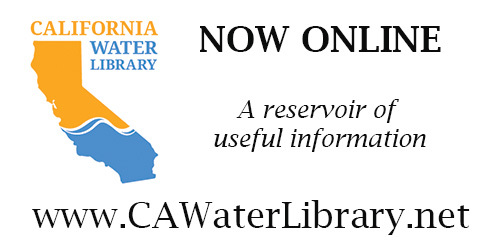 To learn more about water rights, click here to visit an informative page at the State Water Board. To learn more about groundwater rights, click here for more from Maven’s Notebook.